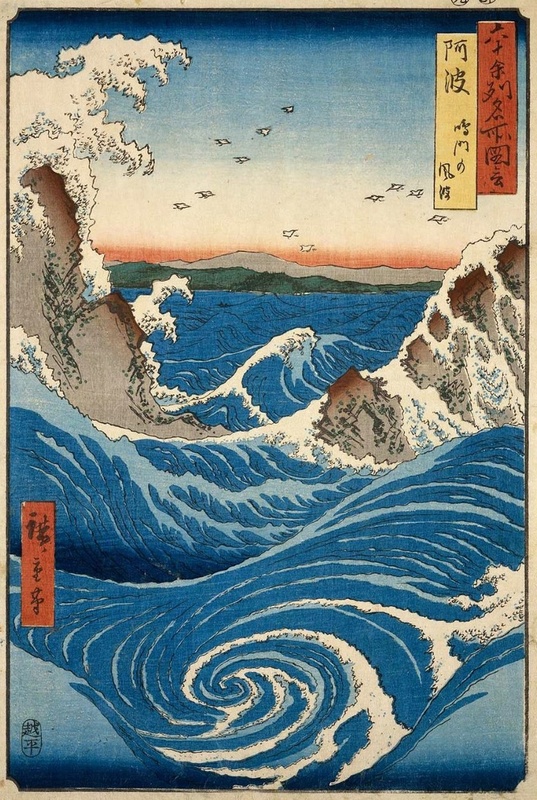 Really felt like looking at some of my favorite Japanese prints from the 19th century this morning, mainly from Hokusai and Hiroshige. 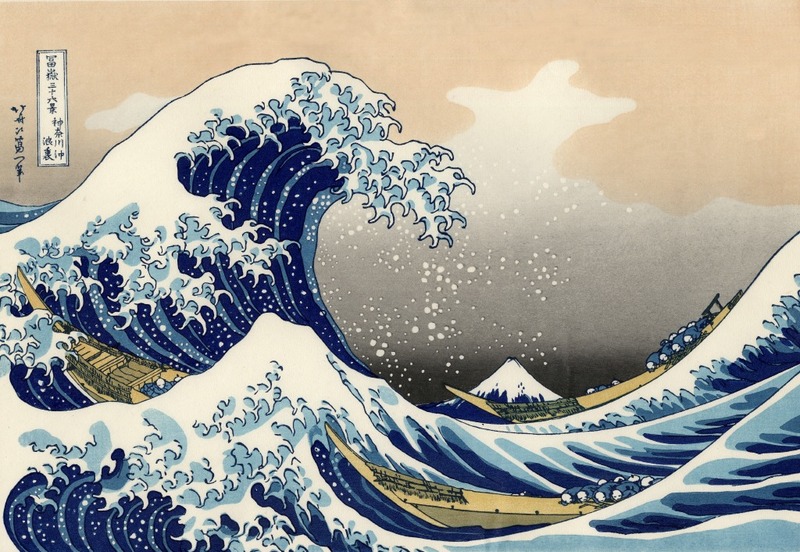 There are a couple here, including the one above, that led to the iconic Great Wave from Hokusai, shown just below. With their great rhythm, harmony, and force, I could look at these pieces continuously and never feel like I’ve looked enough. 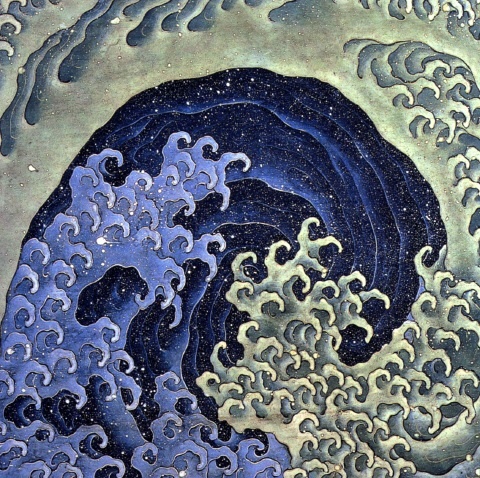 As for the symbolism of the wave today, you can plug in whatever meaning pleases you. I know what it means for me today. And, with a bit of hope, tomorrow. There’s a lot going on in the next few days, with Thanksgiving stacked on top of a couple of other things including getting work ready for my show at the Kada Gallery that opens next Friday, December 1. Everything seems to racing at a frantic pace around here. 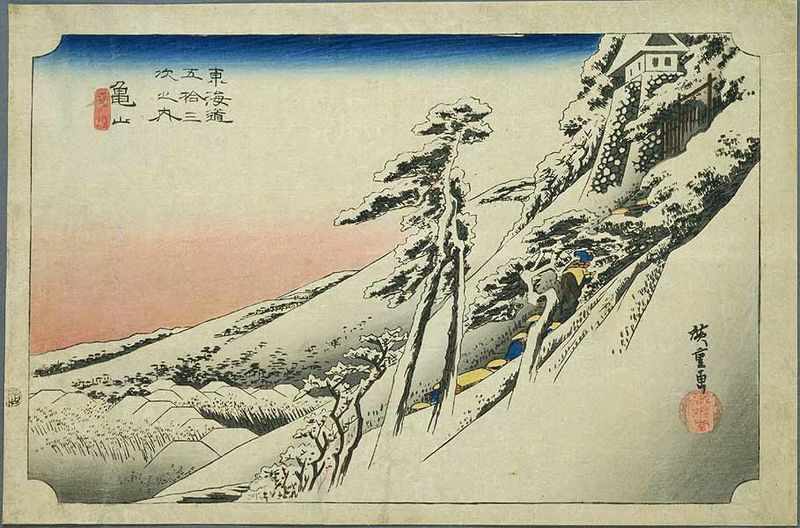 But even so, I took a little time in the darkness of this early morning to stop and savor some work from the great Japanese artist Hiroshige, who lived from 1797 until 1858. Every time I look at his work it feels new and wondrous, with a quality of absolute calm that always soothes. 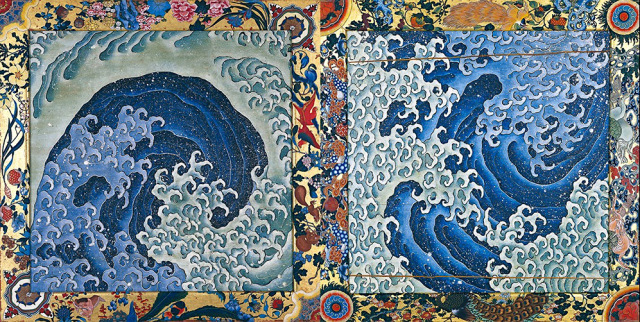 The color is always gorgeous and harmonious while the compositions have an orderliness, even in his treatment of something like the chaos of sea waves, that has a way of setting the viewer’s own internal mechanisms in their proper place and order. At least that is what it does for me. Take a few minutes to watch this video of his beautiful work and allow yourself to slow down just a bit this morning. Everything will find its proper place. When you say homer in Cooperstown, you would normally think of the Baseball Hall of Fame located there. 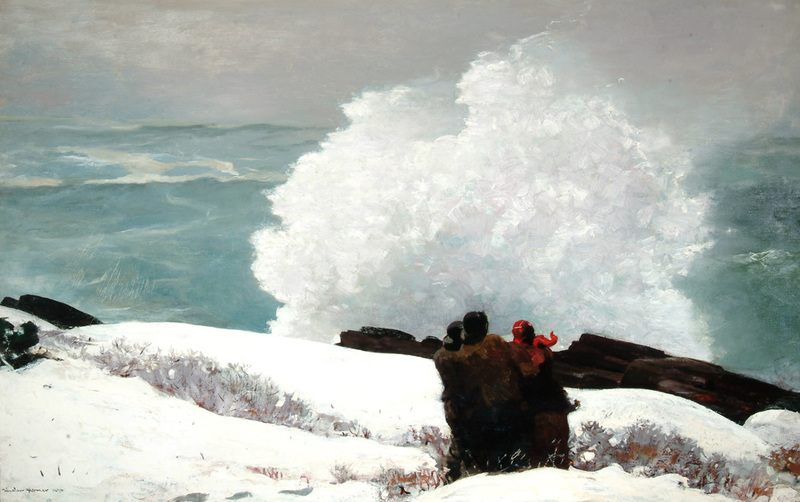 But until August 24th, the Fenimore Art Museum has an exhibit of paintings from American master Winslow Homer from the Arkell Museum collection. We took a quick jaunt out to Cooperstown yesterday to see this exhibit and were pleased with the scope of the show which showed fine examples from all the phases of his career. 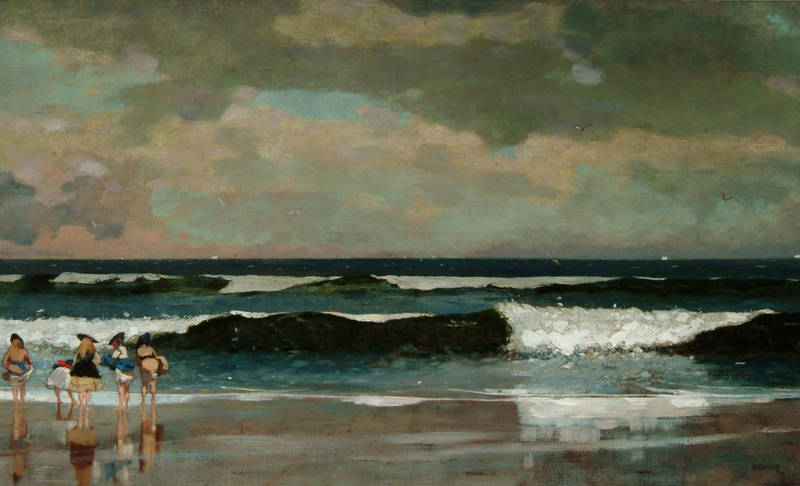 It had some of his illustration paintings from the Civil War, seascapes in oil and watercolor and his light filled tropical watercolors. It really gave you an idea of how talented he was across mediums and how well he controlled the light in his work. My personal favorite was On the Beach, featured below. It was panned critically in its time, generally for all the things that make it feel vibrant in a contemporary sense– primarily its almost abstract composition of bands of color. 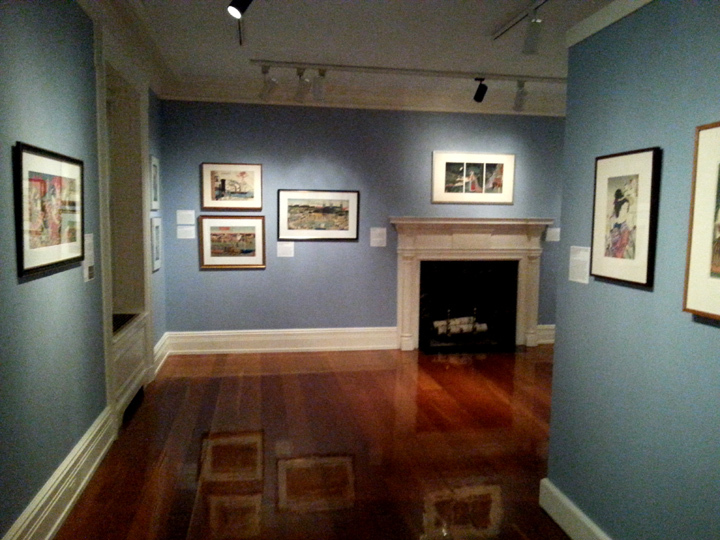 However, for as much as we liked the Homer show, it was group of Japanese woodblock prints that really caught our eyes. It hung in the same space that held my 2012 show and it transformed the space completely. 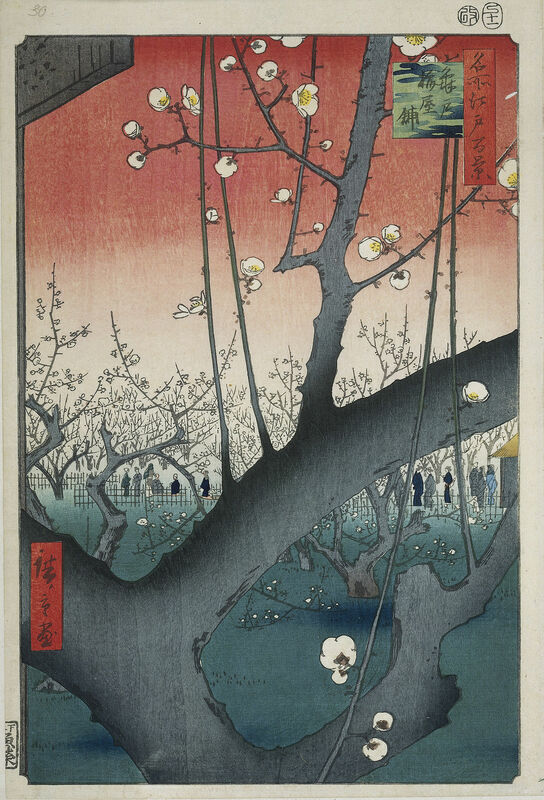 Inspired by the local but widely renowned Glimmerglass Opera‘s production of Madame Butterfly, this group of prints, some from Hiroshige and Hokusai, shows Japan as it made the transition into modernity at in the latter half of the 19th century. It’s enlightening and elegant at once. 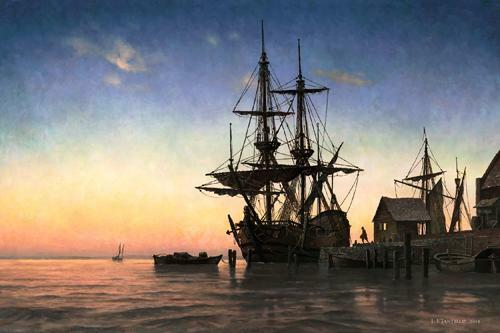 There is also a fine group of historically based paintings of New York state from painter L.F, Tantillo. They are extraordinarily detailed and luminous in the way they are painted. A really unexpected delight as you head down to see the Thaw Collection, the museum’s famous collection of American Indian art masterpieces. So, if you are in central NY any time soon, I really urge you to take a side trip to Cooperstown. There’s baseball and great art in one lovely lakeside village. What more could you ask? It just feels like one of these Sunday mornings. 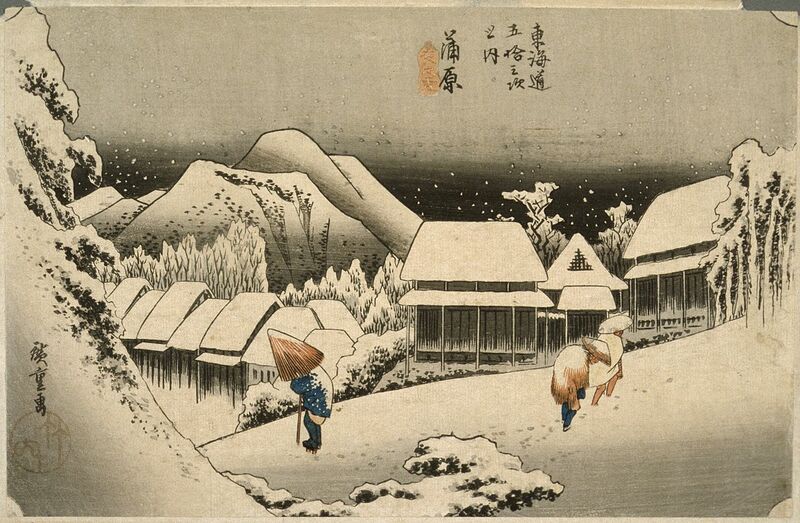 It’s clear and crisp, the colors of the sky outside my studio looking very much like something from a Hiroshige print. Quiet outside. Hardly a rustling through the forest as I made my way to the studio this morning. In my head, I begin to hear those simple quiet notes from the first of the Gymnopédies, that elegant group of quiet and moody music from composer Erik Satie. Hearing this music always slows me down, makes me breath. Ponder things, both big and little. But despite all my pondering, don’t ask me the meaning behind the word gymnopédie. My little bit of research turns up no clear consensus on the meaning from any number of sources. It could mean almost anything actually. And maybe that is why Satie chose it– it sounds likes so much more but is vaporous and edgeless. Here’s a snip of Gymnopédie #1 to start your first Sunday of 2014. I think it is interesting that the maker of this video chose images of the universe to illustrate this music. Big things. I think an image of a snow flake falling gently against a slatey sky would fit as well. Small things. Watching the coverage of the disaster taking place in Japan has brought to mind the many Japanese influences on my work. 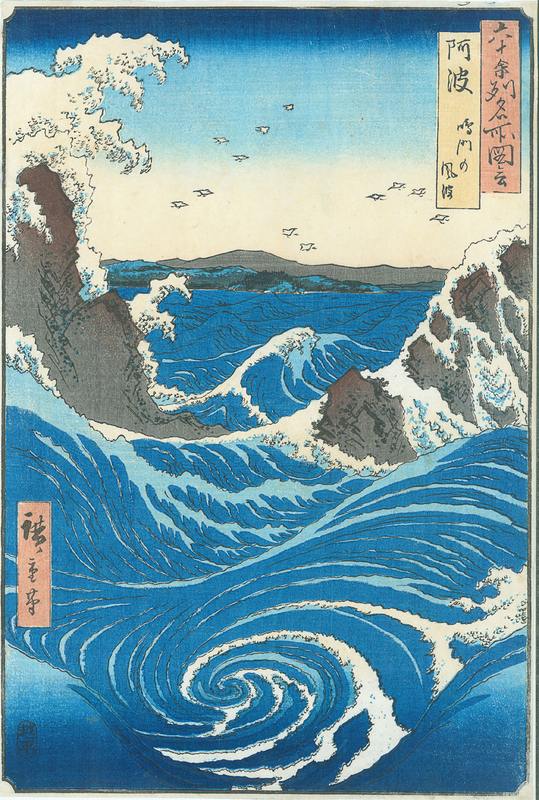 I have always been drawn to the work of the Japanese print masters such as Hokusai, who I have written about before, and Hiroshige. I was influeneced by their work before I was even aware of it, mostly through their influence on the European artists in the late 19th century. 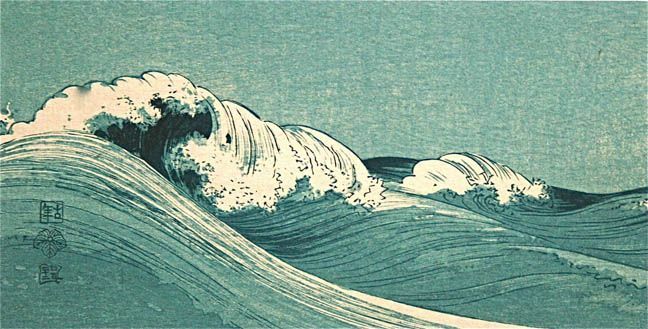 Artists like Whistler and Van Gogh were enthralled by the beauty of their woodblocks, Van Gogh even going so far as simply copying them for some of his earlier paintings. 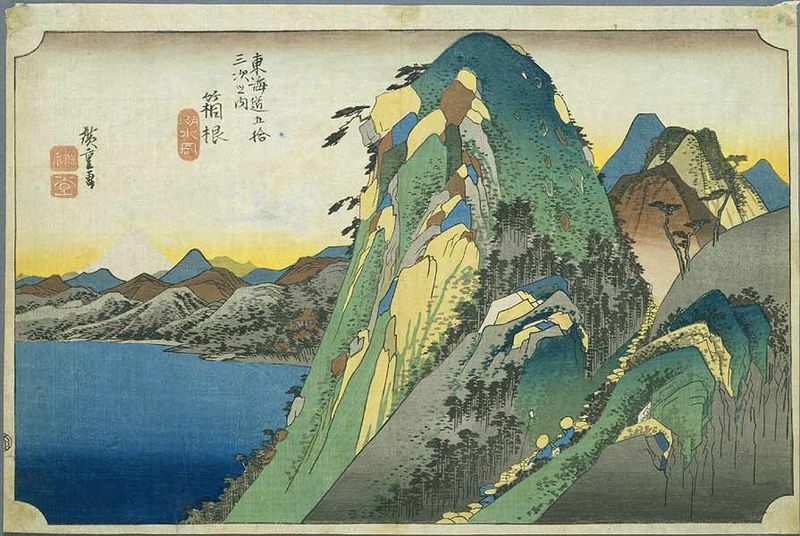 When I began to look more closely at the work of Hiroshige, I too was captivated. There is great unity and totality in the work, a harmony of color and line rhythm that fills the picture frame. The colors are softly graded yet there is deep saturation that is like a feast for the eyes. The landscapes seem to grow organically with lovely curves and lines that evoke that sense of rightness I have often struggled to describe here. They have a great polarity as well. They are bold yet subtle. They are quiet yet not timid. they are simple yet complex. They are both earthly and ethereal. In short, they are just wonderful. Take a look at this beautiful work and how it reflects its homeland. If you can, take a few minutes and donate what you can to relief organizations whose help a great part of this nation is desperately desiring in this time of disaster. I often get comments from people asking about the Eastern, particularly Japanese, influence in my work. 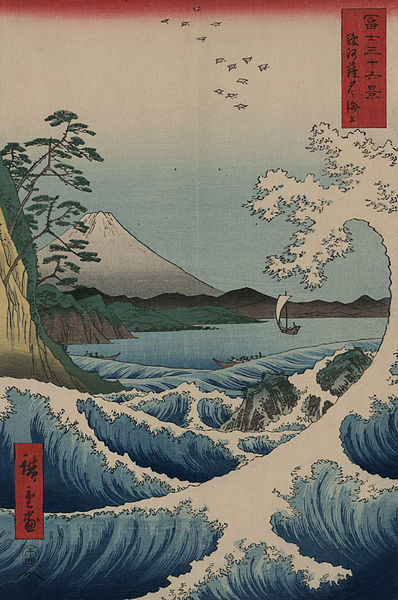 While it has never been intentional, I have always been drawn to the prints of the Japanese masters Hiroshige and Hokusai and their influence inevitably finds its way into my own work. 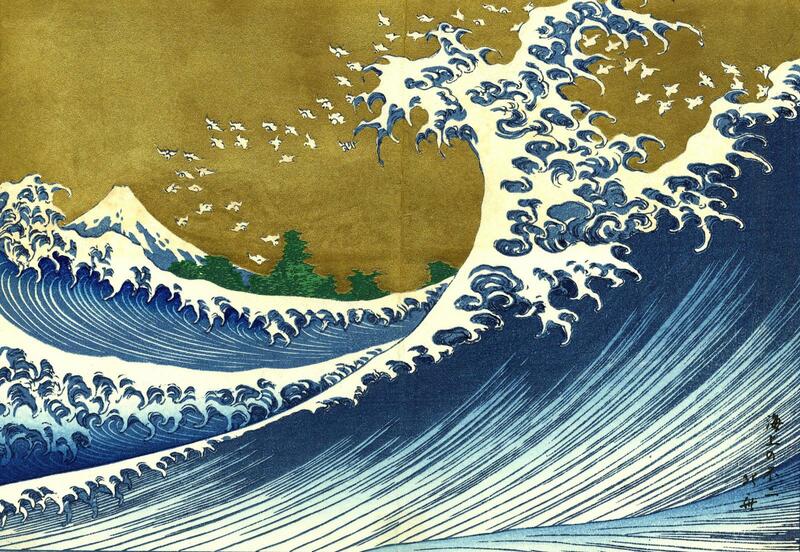 I find the rhythm and structure of Hokusai’s wave prints very appealing. There is a great combination of quietude and motion in the prints, brought to great effect with the use of gorgeous colors and impeccable design. Along with this dichotomy of quiet and movement, there is a omnipresent sense of the immense force of nature over man. 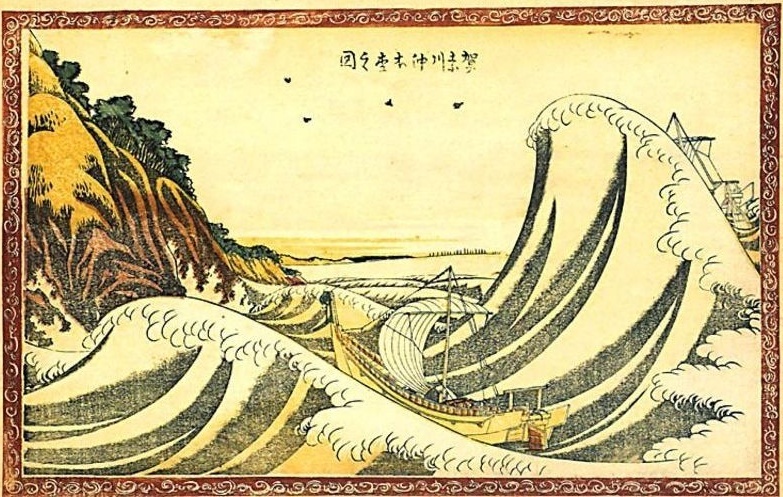 Hokusai often has Mt. Fuji in the distance behind the curls of his powerful waves, reinforcing the power and sanctity of nature. The finger-like quality of the edges of the breaking waves seem like the hand of mother nature reaching out to slap at the reaching hands of her children, the boatmen. Again, reinforcing the dominance of nature over man. 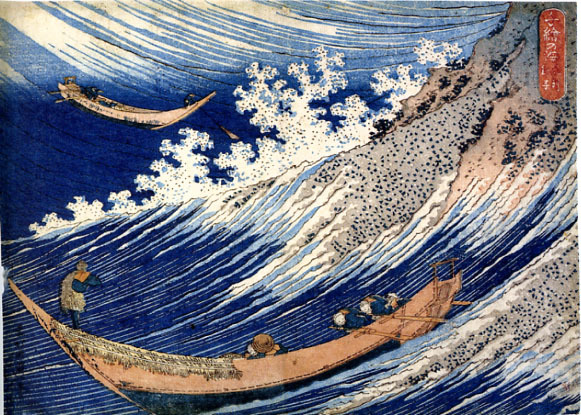 There is a lot more I could say about Hokusai’s work but so much of my appreciation for it is almost indefinable. The work allows me to enter and translate it easily and thrill in the beauty of the lines and hues of the picture plane without determining why I am drawn to it. 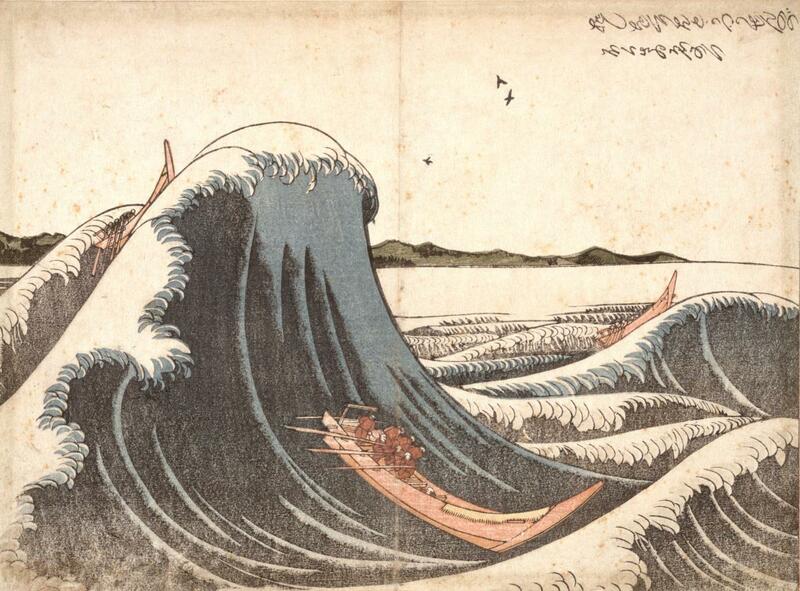 This unquantifiable ease of translation may be the element of Hokusai’s work that I desire to see in my own work. At my first solo show, in 2000, at the Principle Gallery in Alexandria, VA, I was approached by many people all asking the same question: “Can you tell us about your Japanese influences?” If it had been one or two people I wouldn’t have thought anything of the question but this was like 30 or 40 people all asking the same question. I explained that there wasn’t any overt connection or influence from any particular Japanese artist. This was true. I had seen prints, obviously, but hadn’t really looked deeply into them. 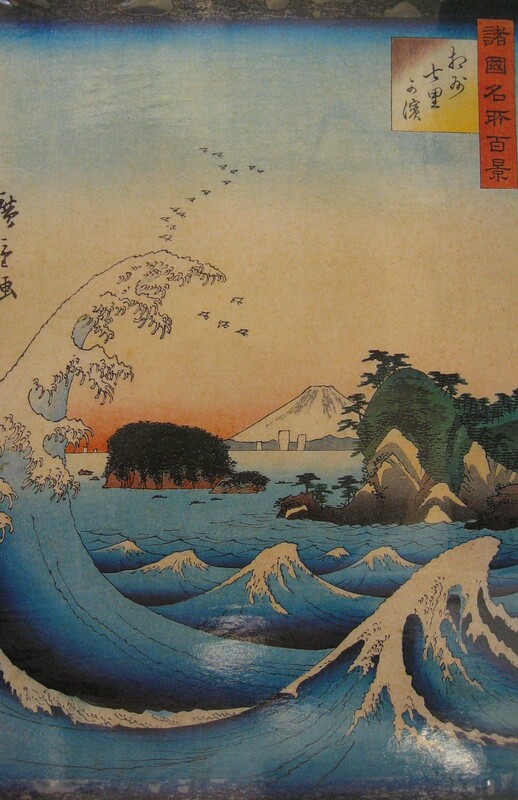 I didn’t even know who Hokusai or Hiroshige were. Didn’t know much at all, to be honest. 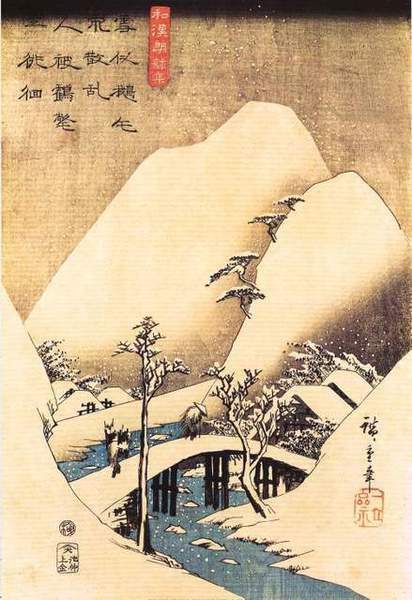 I was more influenced by the haiku poetry form, such as those from Basho. I loved its simplicity and spareness of form, the way those three short lines of verse could create a real sense of atmosphere. You could feel the sense of quiet that I sought in my work. I even had a series of paintings early in painting career titled after the haiku. 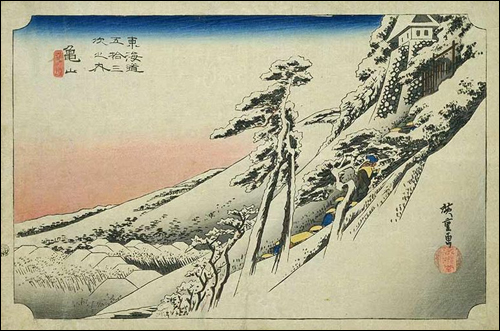 I think that the works of Japanese masters such as Hokusai and Hiroshige carry this same feeling,the same that is instilled in many haikus. There is a placidness, a calmness that permeates the work. I was honored that people saw a similar quality in my work even though the similarity was coincidental. Pieces such as the one shown here, Into Stillness, are among my favorites to paint because of the calm attitude that is required to make the piece come alive. I can only paint them successfully when I am able to shake off all cares and troubles and find a point of stillness. They really don’t come as easily as I might wish.